Can W2H Create the Shifts? HELPERS - Let Them Sign In? - Autofill by "Priority Group"
- Evenly Distribute "Special Shifts"
**How far in advance can I schedule? **How far back are my schedules saved? **How do I save my data? **Create Same Shifts every week? **How do I schedule monthly? **How can I see open shifts? **Repeat shifts for # weeks? - Change Layout - Font, etc. Track Late, Tardy Called Out, etc. - Email Address Marked "None"
**Student class times not available? **Can Helpers be a certain color? **All Helpers see Others' Phone? **What Happens If Delete Helper? **Differentiate types of Time Off? - Set Up Your "Reply To"
**Can I Read Helper Messages? **Coordinators can be signed in at once? **Why Can't I Sign In? @Sign In From Web Enabled Phone^? Upgrade to Higher Paid Level^? Upgrade if Exceeding Paid Level^? **What is a Group Administrator? WhenToHelp provides an internal messaging system that allows you and your helpers to communicate - even if your helpers do not have an email. Coordinators can send messages to one helper, a number of helpers (by CTRL clicking names), all helpers who help for a particular position, other coordinators, everyone, etc. Helpers can sign in and send messages to the coordinator or another helper (To allow helpers to send a message to multiple recipients, you must set that option on your Settings page). When the recipient signs in, they see a new message alert in the "What's New" section of their home page and they can click the link to view the message. 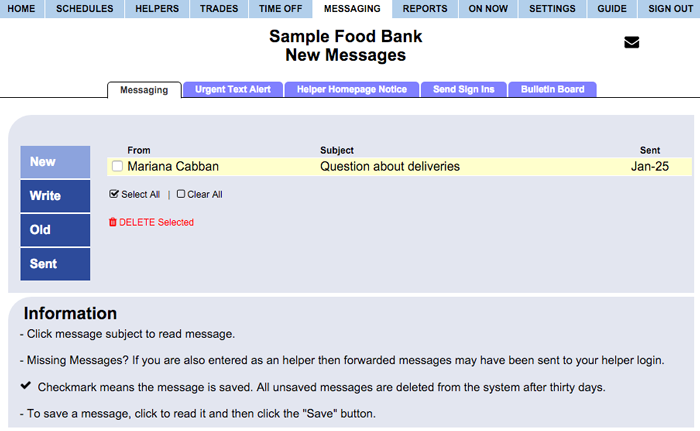 If the helper has email notifications setup, then a copy of any message is also forwarded to their email address. Coordinators and helpers can set all of their Notification options as to when they want to be notified or have messages forwarded to their email or text message addresses. Coordinators can also send URGENT TEXT ALERTS - which sends a short email or text message to helpers who have signed up to receive them. WhenToHelp Messaging is similar to other messaging systems. You can read and send messages, reply, and write new messages, send, forward and save. We recommend having all received messages forwarded to your email account so that you can keep them on your computer for archive purposes. Unsaved messages over 30 days old are removed from our system. Note: WhenToHelp does not currently include a Spell Check feature, but you can compose messages in your word processor, spellcheck, and then copy and paste the text into our messaging section.